Taipei, Taiwan, October 28, 2015 – QNAP® Systems Inc. today announced the release of the latest addition to its Silent NAS series, the more advanced HS-251+ with a quad-core Intel® Celeron® 2.0GHz processor, 2GB DDR3L RAM, and powerful integrated graphics. It is designed as a home NAS for entertainment, and supports a wide range of multimedia applications, HDMI connectivity for local playback, real-time and offline video transcoding, and scalability to accommodate large HD media collections. Housed within a stylish and compact set-top box design with no moving parts and supporting up to two 8TB hard drives, the fanless HS-251+ is the best choice for those looking for a silent NAS, as well as a Home Theater PC/NAS combo. Unlike conventional NAS that come in heavy and sometimes unwieldy boxes that are too big and noisy for being an integral part of a digital lifestyle and living room, the silent & modern HS-251+ NAS inherits the innovative design that won its predecessor the iF Design Award 2014, and perfectly fits alongside HDTVs, stereos, A/V receivers and game consoles. The HS-251+ allows users to connect to an HDTV or an A/V receiver and to use the HybridDesk Station (HD Station) to enjoy rich multimedia content with the best audiovisual experience. HD Station features the powerful Kodi™ media player that enables users to enjoy the videos, music and photos stored on their HS-251+, watch YouTube™ and surf the web with the free bundled QNAP remote control or Qremote mobile app. 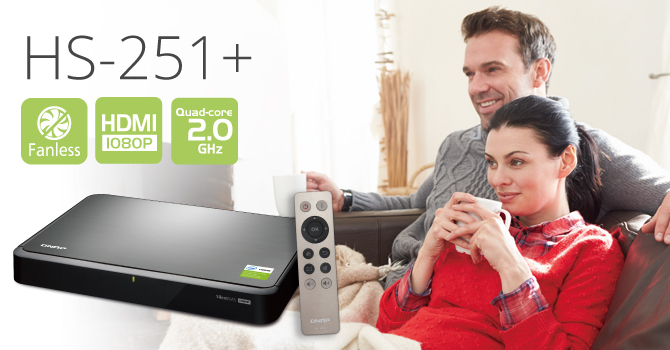 Powered by the latest QTS 4.2 operating system, the HS-251+ is easy to set up, manage and is simple for everyday use. Users can enjoy multimedia, organize and back up files, and synchronize and share to other devices easily with no learning process required. The HS-251+ also supports excellent real-time and offline transcoding capabilities as well as streaming photos, music and videos to different rooms from a single device using Bluetooth®, USB devices, HDMI, DLNA®, Apple TV® and Chromecast™ as a multi-zone control system. And with a wide range of mobile apps, users can enjoy multimedia, access their data and manage the HS-251+ anytime, anywhere. The HS-251+ is an ideal storage for media archiving. Supporting RAID 1 or RAID 0, it is scalable by connecting an expansion enclosure (the 8-bay UX-800P or the 5-bay UX-500P) to provide a total capacity of up to 80TB. With a world of audio and videos stored inside, users can quickly find desired files with the new Qsirch smart search application. The new HS-251+ Silent NAS is now available. For more information of new product and to see the full QNAP NAS lineup, including where to buy, please visit www.qnap.com. QNAP Systems, Inc., as its brand promise “Quality Network Appliance Provider”, aims to deliver comprehensive offerings of cutting edge network attached storage (NAS) and network video recorder (NVR) solutions featured with ease-of-use, robust operation, large storage capacity, and trustworthy reliability. QNAP integrates technologies and designs to bring forth quality products that effectively improve business efficiency on file sharing, virtualization applications, storage management and surveillance in the business environments, as well as enrich entertainment life for home users with the offering of a fun multimedia center experience. Headquartered in Taipei, QNAP delivers its solutions to the global market with nonstop innovation and passion.